Greetings from Huong, Ella, and Kaylee from The 88 Project! We are bringing to you news, analysis, and actions regarding human rights and civil society in Vietnam during the week of March 6-12, 2017. The biggest story of the week was of course International Women’s Day. We are incredibly thrilled about the particular attention given to female activists and prisoners of conscience in Vietnam from international human rights organizations, Vietnamese activists, and civil society organizations everywhere. For our part, we added our voice to those of Vietnamese female activists in demanding the right to adequate and free access to hygiene products for all female prisoners. Also in the news: protests, environmental activism, police brutality, reports from Vietnamese human rights defenders, the Vietnam Cyber Dialogue, and the second award ceremony of the League of Independent Vietnamese writers. Please do check out the Take Action section and sign PEN America’s open letter on behalf of bloggers Nguyễn Hữu Vinh and Nguyễn Thị Minh Thúy. If you have any feedback for us or want us to include announcements and/or articles from you/your organization, please email us at the88project.mail@gmail.com. To stay informed and keep the conversation going during the week, follow us on Twitter and Facebook! On the occasion of International Women’s Day on March 8, 50 Vietnamese women human rights activists and 20 Vietnamese civil society organizations issued a joint declaration that they stood by female prisoners of conscience in Vietnam. Featured prisoners of conscience were: Cấn Thị Thêu, Trần Thị Nga, Nguyễn Ngọc Như Quỳnh, Nguyễn Đặng Minh Mẫn, Nguyễn Thị Minh Thúy, Trần Thị Thúy, and Lê Thu Hà. The Vietnam Committee on Human Rights also paid tribute to all women human rights defenders, bloggers, journalists, activists, and dissidents. Civil Rights Defenders called upon Vietnam to release “all women human rights defenders, activists and bloggers it arbitrarily detains,” featuring in particular the case of blogger Nguyễn Ngọc Như Quỳnh (Mẹ Nấm). 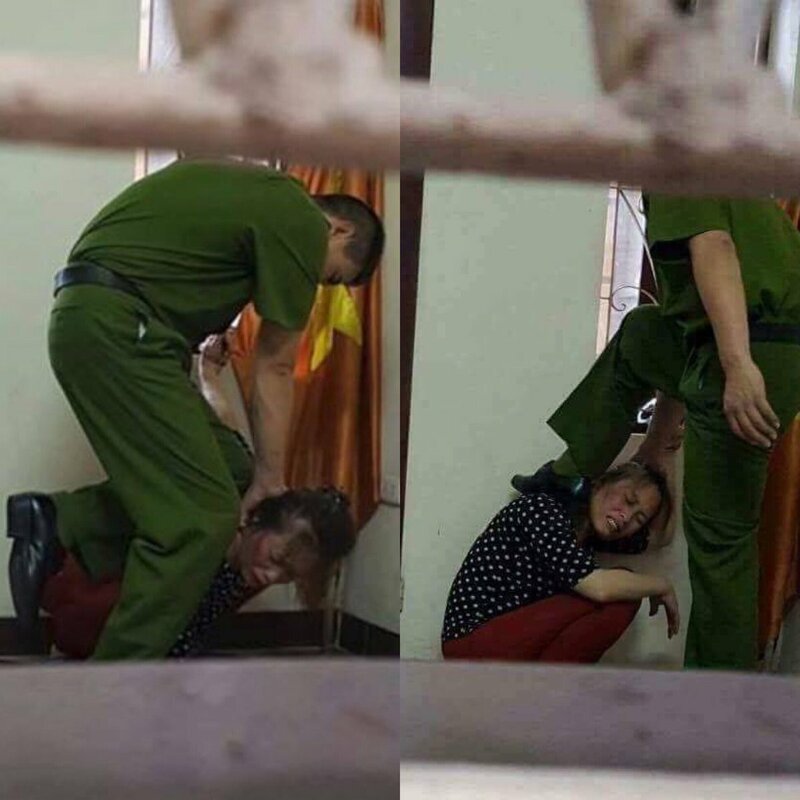 A disturbing photo of a police officer beating a woman with one hand cuffed to a window was circulated quickly and widely on the Vietnamese blogosphere. We are unsure of the origin or the time and place where the incident took place. However, regardless of its context, the picture speaks for itself. Police brutality has been an increasingly worrisome problem in Vietnam. The Ministry of Public Security (Bộ Công An) itself reported 226 detainees died around the country between October 2011 and September 2014. Human Rights Watch also issued a report in 2014 on the abuses of people in police custody in the country. We mentioned last week the arrests of two Hanoi-based dissidents, possibly for releasing the YouTube video “Guide to Lawful Protest” while other activists were circulating an appeal to take to the street on Sundays. Protests on Sunday March 5 did happen, but they seemed to be on a small scale and were quickly quelled by the police. A number of protesters were taken into custody. In Nghệ An province, “several thousand people” from local Catholic parishes gathered after the Sunday mass to protest against Formosa and the government’s inadequate compensation. On March 10, three anti-China activists were detained in Bà Rịa-Vũng Tàu for demonstrating at a local beach to commemorate the fallen soldiers who were killed in Gạc Ma, Trường Sa. The public security forces released them on the same day. Protestant pastor Nguyễn Trung Tôn, who was kidnapped, tortured and robbed in the Central region on February 27, issued a report about the incident. The pastor noted: “I believe the kidnapping, torture and robbery inflicted on us may have been carried out by security forces of the three provinces Ha Tinh, Thanh Hoa, and Quang Binh, as we have not been involved in disputes with anyone. If the attackers had been criminals, they would have robbed us but would not have tortured us in such a brutal way.” The authorities will surely deny their involvement with the incidents. However, how the authorities investigate the matter will say a lot about their attitude towards human rights defenders and whether they were behind or tacitly condoning harassment against the activists. The report of the Former Vietnamese Prisoners of Conscience (FVPOC) association, “Human Rights Violation in Vietnam 2015-2016,” which detailed the increased violence against activists and human rights defenders, is now available in English. We do have some good news to share! The second literary awards by the League of Independent Vietnamese Writers went smoothly on March 3 with only minimum interference (two members were prevented from leaving their house to join the award ceremony). In case you missed it, the League’s first award ceremony last year was quite a saga. In Valencia, Spain, the first Vietnam Cyber Dialogue took place on March 5 as part of the Internet Freedom Festival. It brought together Vietnamese human rights activists from both Vietnam and abroad, community leaders, policy makers, and technology experts to discuss ways to improve access to information and freedom of expression in Vietnam. Check out our own @EllaGancarz’s interview at the event. The U.S. State Department released its annual Country Reports on Human Rights Practice on March 5. Here is the country report for Vietnam. It is worth noting that this year’s release lacks the usual fanfare accorded to it under the previous administrations. The Trump administration clearly does not care. Welcome to the post-human rights world (this is actually the title of a relevant and thought-provoking piece by Sebastian Strangio on the current global state of human rights). Given this context, what do the changes under the Trump administration mean for U.S.-Vietnam relations? Check out this thoughtful analysis, “Human Rights on the Line: What does Trump mean for US-Vietnamese relations?” by our own @KayleeDolen. Did you know that this month last year, in March 2016, 7 activists were convicted in one week? The 88 Project has an updated timeline of human rights related events in Vietnam on our website, where you can review what has been going on since the 1950s! Check it out. Amnesty International compiled a reliable list of Prisoners of Conscience in Vietnam last year: 86 POCs in total, among them 12 are women, as of July 2016. Note that these are only a selection of prisoners of conscience identified by Amnesty International. The true number is believed to be higher.